Posted on July 27, 2015	by J.
George’s birthday landed on a Sunday this year and it was the same weekend as a big lacrosse tournament out in Colorado so I basically spent his weekend in Colorado. I had never been to Colorado, and George and I had talked about vacationing there, so I made sure to attend this tournament and then honor him on his birthday. For those of you who have read this from way back when I first started this blog, I recall flying over the Rocky Mountains the first Christmas I spent without George and staring down at the mountains and seeing them in all their beauty and glory. Then finally in June of 2014, I headed to Switzerland and went into the Alps and once again I yearned to visit the Rockies. George and I hiked in New Mexico and I remember how wonderful it was trekking through the mountains with him and seeing the snow, or trekking down to a hot spring. It always felt so mystical. So finally, I grabbed a flight and booked a hotel and it was Colorado full speed ahead. On his birthday, I wanted to be in the Rockies, not some strange tributary (I don’t know the correct word for this) off of it. So I looked at a map for a good point of attack and there it was: Georgetown. I got in the car and I drove almost 2 hours upward to the little valley where Georgetown rested. IT WAS BEAUTIFUL! 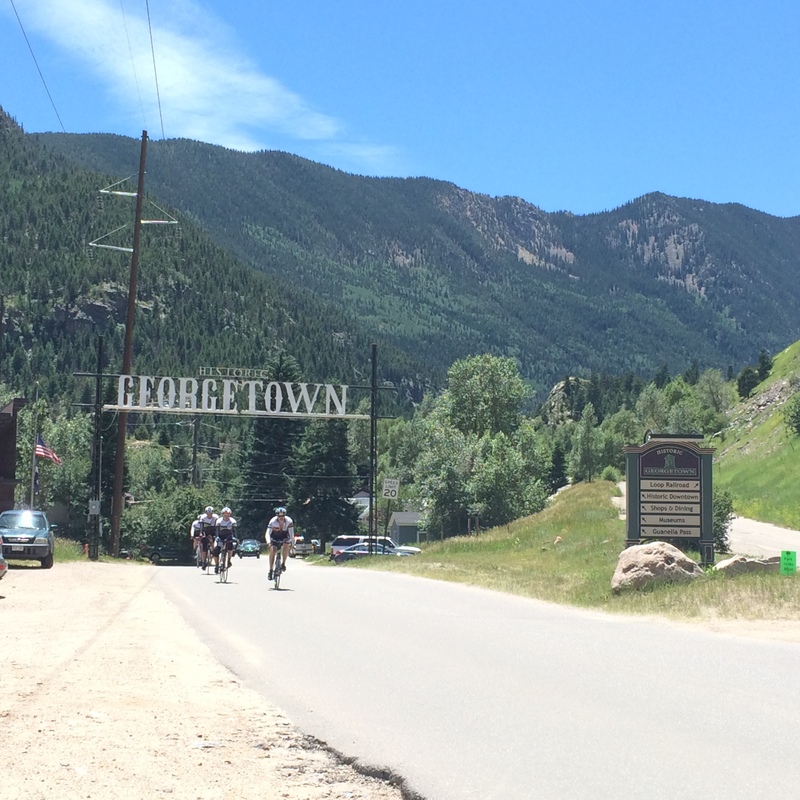 Not only that but strangely enough Georgetown was known for it’s incredible meatballs (George loved meatballs, vegan or not), and the elevation was 8,519ft. Why is this 8,519 a special number, I’m sure many are wondering. Well because George graduated from HS in 1985 the same year I was born. We found that funny. Number 19 is my favorite number and oddly enough George’s HS hockey number, so we made sure to get married on the 19th. Plus there was this crazy bike race going on that day, and we all know George loved bikes. So there you have it, 8519 glared at me as if I was meant to be there. As if George was waiting for me to finally arrive in Georgetown. I walked all over the little town, and finally I headed toward the Rockies. I brought some of George’s cremations with me so he could enjoy the experience with me as well. 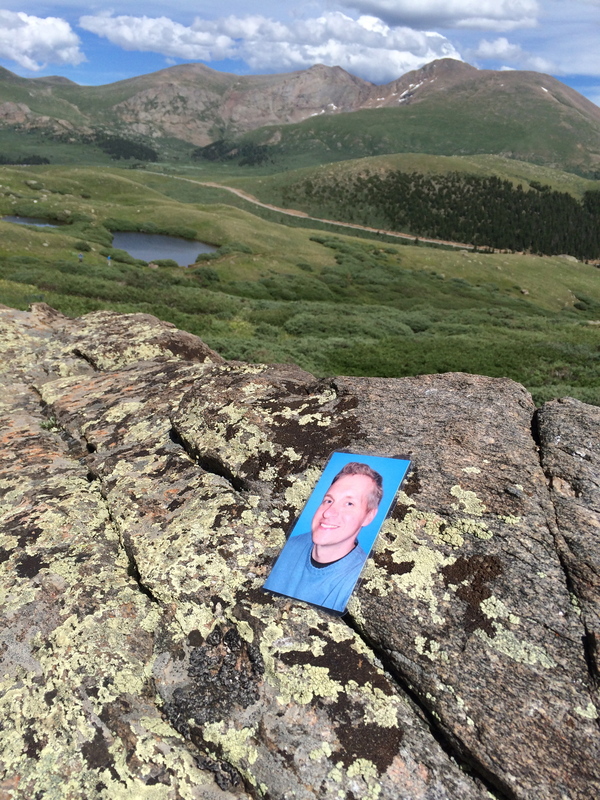 And together we climbed 12,000ft and enjoyed the picturesque backdrop I knew these magical mountains would provide. It was beautiful, and the greatest way I could have imagined spending his 48th birthday. This entry was posted in Uncategorized and tagged bereavement, bikes, biking, Birthday, colorado, elevation, George, grief, hiking, knee problems, knees, lacrosse, love, recruiting, rocky mountains, widow, young widow. Bookmark the permalink.